You leave a 2 year old in charge of card design? I think some of my words of ‘wisdom’ may have gone in as she talked to herself whilst sticking ‘this one goes here, yep, no, not enough room there.’ There was some planning involved on her part despite the chaotic appearance, and it is reasonably colour coordinated! She was a bit heavy handed with the pearls but they were a Poundland bargain so I’ll let her off. Sooo cute! I love the castle die-cut, It is so beautiful! Thank you, I love it too, though it is a very fiddly one to get all of the little bits out of! I think that is amazing for a 2 year old, obviously a budding crafter in the making. Thank you, she knows her own mind that’s for sure. Oh, Mrs. Craft, this brought back fun memories of helping my kids craft! “Less is more” is such a difficult concept – I remember helping a 3rd grade class with scrapbooks, and several of them just just couldn’t quite grasp the meaning behind the words. It is a tricky concept isn’t it? My help wasn’t much wanted, I was there more to prevent the whole thing descending into utter chaos! It is so fun to see the finished project! Thank you, it is one of my favourites, though I don’t enjoy poking all of the tiny pieces out at the end! She did! She didn’t want to stop but I’d run our of butterflies and that was all she wanted! I believe this card is a good example of ‘living the dream’! Who would not want to live in a home like that? It is pink, it has turrets, and surrounded by a sky made of butterflies and pearls. Heavenly! That’s one way of looking at it! I think she’d love it, I’d be running away from the butterflies. Well, judging by scale you may have a point there! Don’t think they are carnivores though. Hopefully not. It looks horribly like there’s a plague of them! I think that card is BRILLIANT! It’s co-ordinated. It’s balanced. The dream castle is in the sky (as any good dream castle should be) and the big ‘heavy’ flower is down in the lower half, where weight should be. As for the gorgeous little flowers and butterflies … fabulous!. Flowers would be floaing around in a dream scene, and the butterflies would be there to make people smile and sniff the flowers! Finally … the Pearls. Any Decent Young Lady is obliged to have Pearls. I’m only ever seen with pearls in my ears. Your young crafter has a natural talent. 🙂 I think we should all be very worried! shaking in her boots ~ Cobs. Laughing like an absolute drain here!!! Ohhhhh bless her. She’s another one like daughter No.2 (of mine). She was helping one year to decorate the Christmas Tree – (she was about six or seven) and she wanted to hold some of the very old, glass baubles to put on the tree. At first I said no (because I knew what she’s like) but she began to throw a wobbly, so in the interests of keeping it all light and lovely, I held a bauble in my hand and held her hand in my other. “Sweetheart, I’m going to let you hang this one on the tree, but …. you MUST be very careful with it. You see, although it doesn’t look like it, it’s actually MADE OF GLASS! So you mustn’t squeeze it or hold it too tight. Just hold it gently. Ok?” “Ok” she replied. I KNEW I was doing the wrong thing. I turned my head to reach into the box and pick up another bauble…. CRRRACCKKKKKK! shattered glass all over the place, a cut finger and a sudden sound of “whaaaaaaaaaaaaa” because she’d done the very thing I told her not to do. I’d inherited that bauble, and it was so old that we believe it was worth around £100.00 ($124 US dollars). While I was bathing her finger and putting a plaster on it, I asked her why she’d done it. She said it was because she didn’t believe I “was tellin d twufe”. She didn’t believe that the bauble really was glass. She still remembers the whole thing today, and says that she really didn’t believe that the bauble could be glass. Kids! Love ’em …. but couldn’t eat a whole one. Fabulous. The start of much crafting to come. Such a nice dreamy card! She is very talented! You don’t have to hide your stuff, leave some available for her at any time and your little princess will be busy creating! Beautiful! You have quite the little crafter there. 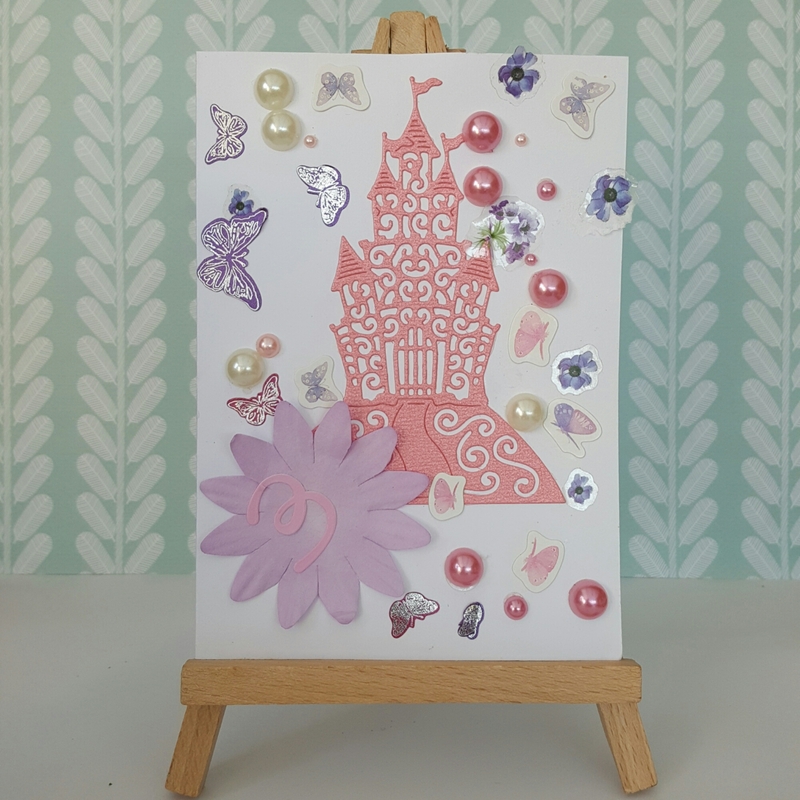 I think tat card has been designed splendidly, MrsCraft… I’m very impressed! Apologies… that ‘tat’ should read ‘that’ – my aitches are a little hintermittent at the mo! I love that! I bet the little girl who gets it will love it too. What a talented little lady!